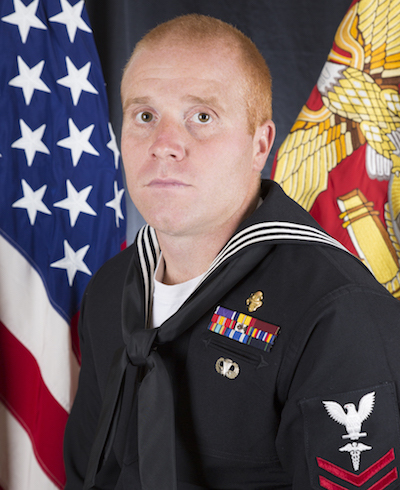 Hospital Corpsman First Class Ryan Lohrey was born on Aug. 24, 1986 in Middleton, Indiana. He attended Shenandoah High School and entered the Navy on Sept. 27, 2007. He graduated from boot camp at Naval Recruit Training Center, Great Lakes, Illinois in November 2007, then attending Hospital Corps “A” School and Field Medical Training Battalion “C” School. In January 2008, HM1 Lohrey was assigned to 2nd Reconnaissance Battalion at Camp Lejeune, North Carolina as a newly minted Field Medical Service Technician. In October 2010, HM1 Lohrey deployed to Afghanistan in support of Operation Enduring Freedom. He then attended the Basic Airborne and Special Operations Combat Medic courses in Fort Bragg, North Carolina and was assigned as the Assistant Leading Petty Officer of 2nd Reconnaissance Battalion. In June 2015, he attended the Marine Combatant Diver and Dive Medical courses, successfully earning the Navy Enlisted Classification 8427 Special Amphibious Reconnaissance Corpsman. In November 2015, HM1 Lohrey transferred to 2nd Marine Raider Battalion, Camp Lejeune, North Carolina and was assigned to Marine Special Operations Company F, Team 8211 as their Special Amphibious Reconnaissance Corpsman. In July 2016, he was deployed to Northern Iraq in support of Operation Inherent Resolve. He was later reassigned to Marine Special Operations Company H, Team 8231. HM1 Lohrey’s personal awards include the Purple Heart, Navy and Marine Corps Commendation Medal, Combat Action Ribbon with gold star in lieu of second award, and the Navy Good Conduct Medal with bronze stars in lieu of third award.